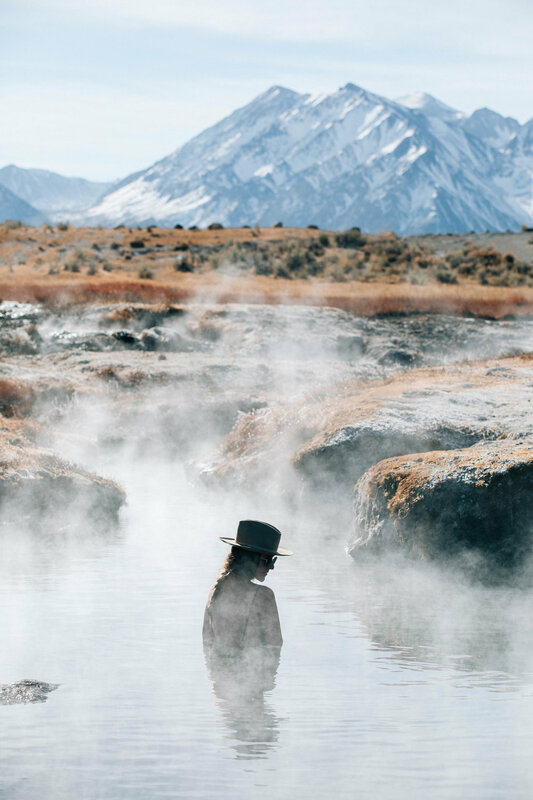 With iconic Californian routes such as the 101 and PCH, there’s another hwy worthy of a road trip: Highway 395 to the Eastern Sierras. 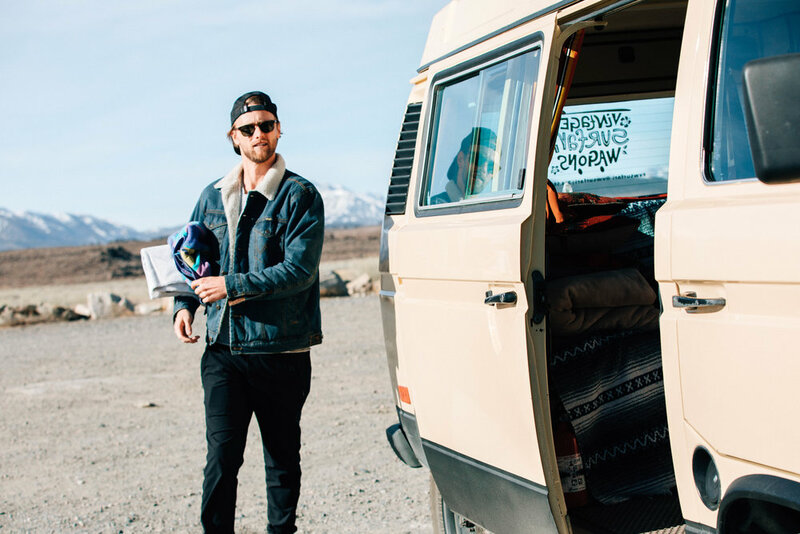 I grew up taking HWY 395 from LA to June Mountain (Mammoth’s sister mountain), but as a high schooler focused on friends and snowboarding, I guess I never even bothered to look out the window to see just how majestic everything else other than skiing is in this part of California..
I’ve dreamed of hopping on the #vanlife movement, and found an amazing rental company out of Costa Mesa that has a massive selection of VW vans in just about every color. Vintage Surfari Wagons is run by Southern California natives Bill and Diane Staggs who have a deep love for adventure and the VW bus. We were lucky enough to have the Hale Pua, a 1982 Vanagan Westfalia dream as our home away from home for our road trip up the 395. Our first stop out of LA was the Alabama Hills right next to Lone Pine, CA. Honestly, I had no idea just about every Hollywood Western was filmed here with many of the local residents being extras in these films. I definitely recommend going into the Lone Pine Film History Museum to get a better history of the area. Also definitely recommend stopping at Gus’ Really Good Fresh Jerky in Olancha on your way in. Perhaps it was the time of year (Mid December), but the Alabama Hills felt untouched. We felt like we were the only ones there! Our camp spot held the perfect backdrop of Mt. Whitney. Next up we went to Big Pine with the intention of hiking up to Second Lake (original name, I know). I had seen pictures on Instagram of this glacial lake that looked like something you would find in Patagonia. I had to see it for myself.! It's a 13 mile hike which we weren't really prepared for but so determined to make it. The views were freakin epic the entire way, especially once we got into the snow covered portion. Since it was December, the days were shorter, which meant we had to turn around by 1PM to make it back before the sun set. By 1PM we still hadn't made it to First Lake, so we had to turn around by 1:30PM.. ok 1:45 PM.. ok 2:00PM.. wait.. 2:30PM! I'm telling you we were so determined to make it Second Lake since we had come so far! And I needed to see if the grams were real. By 2:30 PM, we had made it up to Second Lake! It's one of the most stunning places I've visited in California. 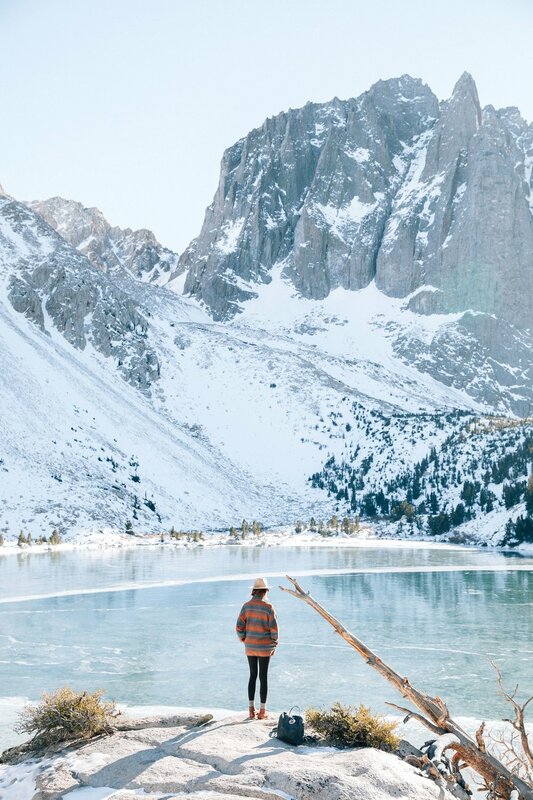 The lake was frozen and would make almost a hauling noise in the silence. The photos barely do this place justice. Well, it was nearly 3PM and we just booked it down that mountain! The sun had set but thankfully there was still enough light by the time we got to our car (insert Praise Hand Emoji here). Next up were the Mammoth Hot Springs, which is what had inspired this road trip to begin with. 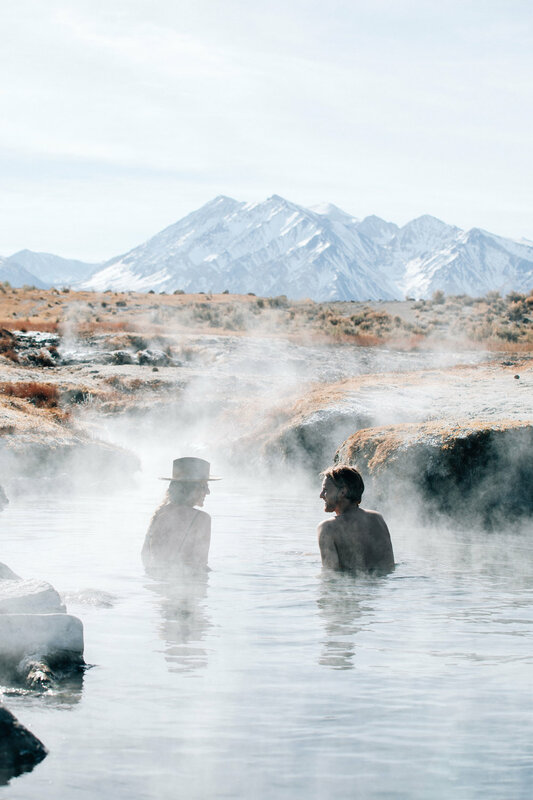 There are natural hot springs all around Mammoth that you can just drive up to, get out, and soak for however long you want with the best views of the snow covered Eastern Sierras. We made it to three different ones. Wild Willy's, Shepherd, and Rock Hot Tub. I loved Wild Willy's because there is a hot spring shapes like a heart! Shepherd is for 4 people max which was so cute and darling. And Rock Hot Tub is for two people max, but not nearly as warm as it should be to be enjoyable in the middle of winter :). Another favorite stop in the Mammoth Area was Geological Hot Creek. It's out of this world beautiful. The furthest we made it up was Mammoth but you can continue up to the Travertine Hot Springs and Bodie Ghost town on your way to Tahoe. When it came to finding good food + coffee there’s a number of cute spots along the road. Schat’s Bakery is a must for baked goods, Black Velvet Coffee for your caffeine mix, Good Earth Yogurt for a healthier meal and Bishop Burger Barn or Mahagony’s Smoked Meats for an All-American meal. I couldn’t believe just how stunning the landscape is on the other side of the Sierras. It was magical watching the sun rise and set every day turning the mountains pink in the morning and a purple blue in the evening. 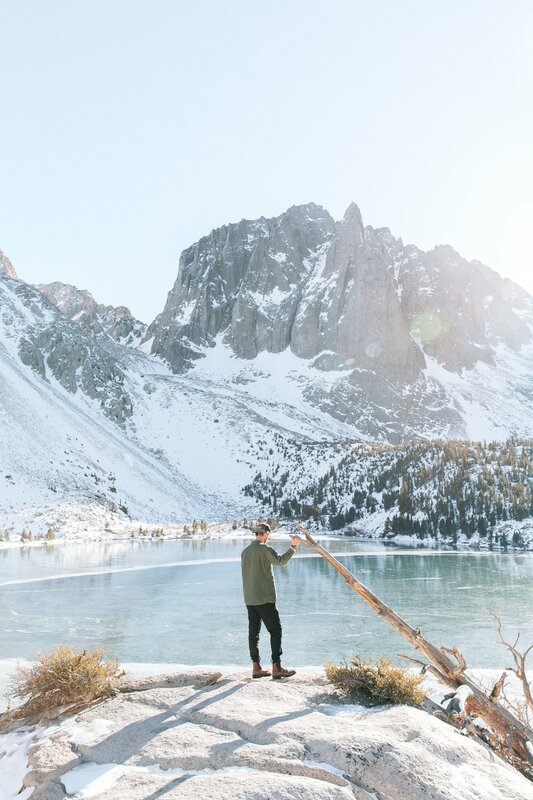 Don’t get me wrong, I love the snowboarding and skiing that you have access to in Mammoth and June mountain, but the terrain surrounding these resorts are every bit adventurous as they are gorgeous.